Leprechaun Hills slot is one which ticks the Irish stereotype boxes, every one of them! It won't surprise you to learn the game's 40 pay lines over 5 reels of 4 rows are filled with symbols you might expect. Yes, Pints of dark stout, lucky shamrocks, toadstools, horseshoes and of course not forgetting the iconic little green Leprechaun with the obligatory orange beard and hair sticking out from under his pointy green hat. In case you were wondering, the soundtrack is the omnipresent Irish fiddle music that accompanies this theme wherever it occurs - think Rainbow Riches Reels of Gold or Irish Eyes 2! This could all be perfectly acceptable if the game offers something different though - but does it? With the 4 rows and 40 pay lines you may expect to have stacked symbols and you would be right. Aside from the picture symbols described above, you have the usual card icons also stacked, the lowest of which pay 1.5x stake for 5-of-a-kind. Our friend the Leprechaun pays best at 25x stake for 5 and as such offers the game's best potential pay, 1000x bet for a full screen via the symbol stacks. 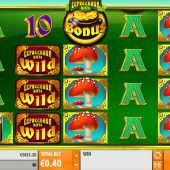 There are Wilds fully stacked only on reels 2 and 4 which don't multiply but assist in gaining you the first feature on Leprechaun Hills slot, an in-play respin. The Lucky Respin feature occurs every time you land any win consisting of the premium (picture) symbols with or without Wilds. The fiddle music gets even more frenetic, so much so that you almost expect Michael Flatley to burst from your screen in a frenzy of tap dancing and the winning symbol materializes over the game in super stacks and then the reels spin - any resulting win from the super stacks is added to your original one. There is potential in this respin if it goes right for you! There are 3 bonus Moneypots on the centre 3 reels. Landing these triggers 7 free games which cannot retrigger. The enhancement? 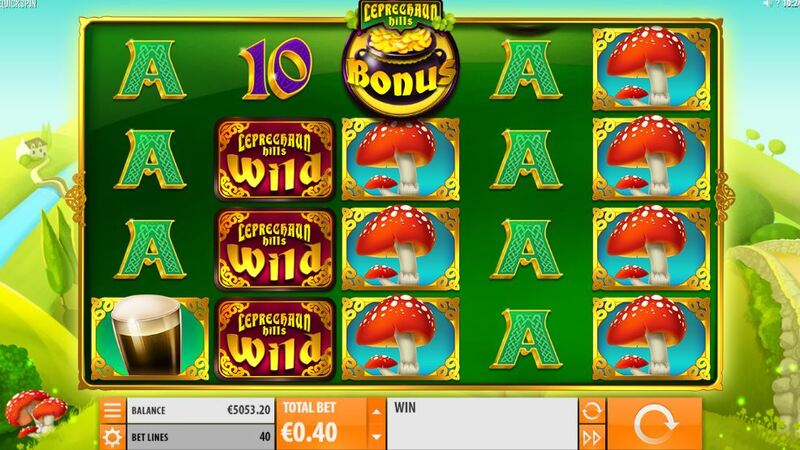 - well one stereotypical symbol yet to appear on this Irish-themed slot is the Rainbow and it is added to the reels in pairs for these free games. All those that land will transform into a premium symbol after each spin which may or may not help you gain a win.